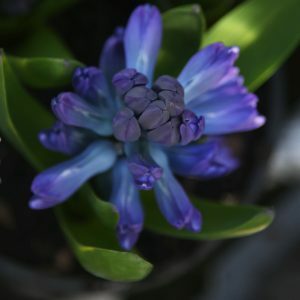 A popular bulb, Hyacinths are grown for the long lasting scented flowers and are available for sale, and best planted in late summer to autumn. With a strong perfume and rather stately flowers they come in a range of colours from white through to blue and deep pink and are relatively easy to grow both indoors and out. A bulbous plant with upright, strap shaped, glossy leaves the flower spikes consist of small, trumpet-shaped florets on leafless stalk. 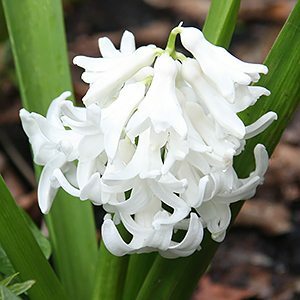 Hyacinth are fragrant and can be used as a cut flower they prefer a well drained soil mix. Flowering in spring, Hyacinths are usually planted at the beginning of the year and are available for sale from February through to May or June. We suggest digging the soil over well before planting to around 30cm, dig in some well rotted compost and then plant the bulbs at around 10cm – 15cm deep. Water in well with a liquid seaweed fertilizer and then mulch lightly, any weeds that appear should be removed. Remember that these are a fairly low growing bulb, only reaching around 20cm in height so plant towards the front of the border. They look great in containers in groups of 8 or more, but also do well in the garden. If you live in warmer climates try to replicate the cold winters that hyacinth bulbs like by giving them 2 months in the fridge (not the freezer) before planting. Plant in the garden or on pots, or if you like, indoors in special Hyacinth Vases. In the garden plant bulbs in a humus rich well drained soil about 8cm apart. Cover bulbs and water in well with a seaweed based fertilizer. In pots you can plant then closer as long as you repot every year. Hyacinth Vases are used for growing Hyacinths indoors and often for forcing hyacinths to flower out of season, the bulb sits in the neck of the vase and the roots work their way down into the water below. Bulbs can be lifted after the foliage has died off.